That brands need to be part of the conversation in social media is axiomatic and obvious. But can brands be part of a conversation in which they are not participating directly? Yes, through influencer marketing. Influencer marketing enables brands to cede at least partial control of their message while customers, advocates, online journalists, and others steer the story of the brand and its products and services. Most of our consulting clients at Convince & Convert are large, global brands. As consumer, most of us would be thrilled to get a Twitter reply from them. Even though many of these companies have broad reach on their own, they also leverage social media influencers to increase niche reach and/or to enhance authenticity. But this only works when marketers align first with suitable influencers, and then determine how best to work together. Here’s how. Brands in regulated industries care about trust and authenticity as much as companies outside those categories—maybe more so. But because of limits on what can be said and by whom, many regulated brands take a conservative approach to social media and content marketing. The upshot is that the brands that do push harder stand out even more by comparison. One of our clients is a major insurance company that you see on TV every day. They are comfortable creating strong content for their audience of policy-holders and prospective policy-holders, but they wanted to increase reach, boost authenticity, and supply even more interesting tips and advice online via their blog and YouTube channel. The goal wasn’t (and isn’t) to create content about their products—because content that is only about your products is just a brochure. Instead, the key is to create content that fulfills the brand’s role as a trusted advisor and resource. Freshness: How recently had the blogger posted content? How frequently did they post? Traffic: What is the blog’s traffic? How much audience has the influencer aggregated? Social footprint: What are the opportunities to work with the influencer in social? Are they active on Twitter? Facebook? Instagram? Pinterest? Once we identified potential influencers and vetted them with our client, we worked with the influencers directly to brainstorm and create content that all parties felt showcased the unique points of view and expertise of the influencers. In 2016, we discovered and worked with nearly 100 influencers as part of this program. One of the other big questions around influencer marketing right now is how to measure impact and effectiveness (our Influence Pros podcast has many episodes devoted to this issue). 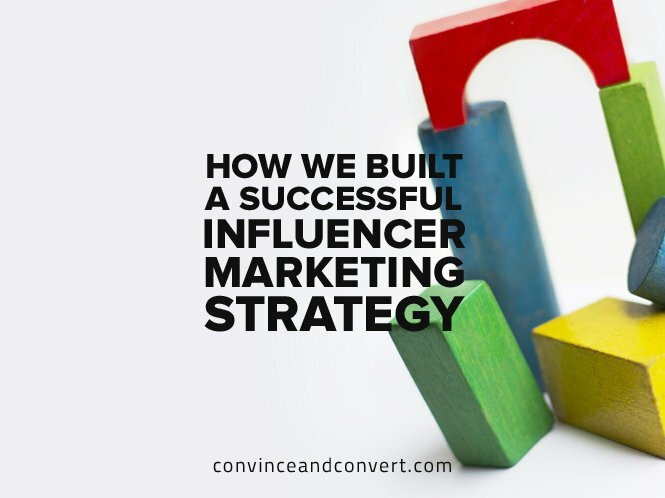 At Convince & Convert, we’re often asked for guidance about how to track an ongoing influencer marketing program. But in many cases, we’re asked to figure this out once the program has already commenced, making pre/post comparisons difficult and unreliable. So it was fantastic when we were asked by one of our long-time agency partners (we support many independent agencies with their social/digital/content/influencer strategies) to help measure a yearlong travel influencer program for one of the largest states in the nation, before the program started. Influencer Log: Record every influencer who is part of the campaign, the dates they are expected to contribute, and every social channel or website/blog link associated with them for tracking purposes. Content Log: The nagging feeling that some tweet or blog post will go uncounted is avoided with a tracking system in place, be it manually recorded in an workbook or auto-saved in the firehose of data GroupHigh collects. We’re fans of the GroupHigh Bookmark and URL Grabber plugins that allow click-to-add to any engagement report. Keywords: Most experiential campaigns or events have unique dedicated hashtags, but also be aware of other, spin-off hashtags that originate from the experience, as well as keywords for places or products used in the campaign. Reach and Engagement: We used GroupHigh to measure the reach and impact of each blog post and several other tools to do the same for social media content. Equivalent Media Values: Marketers are challenged to show ROI on all campaigns. Many agencies are asked to value blog posts and Instagram photos in the context of traditional media placements. Personally, I’m not a fan of equivalency reporting because it measures two things that are quite dissimilar, but I understand why brands and agencies gravitate toward it, so we created an equivalency valuation formula for this project. Codifying and simplifying the influencer tracking process allowed the agency to see the connections between initial goals and resulting outcomes all the way through the campaign. They were able to make real-time decisions to make the experiences even more effective for the influencers and the tourism client. Using tools to help find and measure influencers is an absolute requirement. Some brands and agencies still do a lot of this work manually, starting with Google searches and ending in Excel spreadsheet hell, but I’ve got no interest in using time that inefficiently.